The shooting at a Pittsburgh synagogue joins a list of more than 200 other ideologicallymotivated attacks by far-right extremists since 1990. Unfortunately, it’s not new for far-right extremists to vilify non-white, non-Anglo-Saxon and non-Protestant religions. Judaism has endured most of their ideological rage and conspiratorial paranoia. 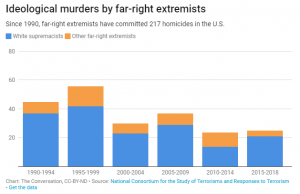 For more than a century, extreme far-right ideologues have peddled anti-Semitic and racist conspiracy theories. Their dogma claims, falsely, that globalist Jews have infiltrated the government and other U.S. institutions, and that Jews and non-whites pose an existential threat to the white race. 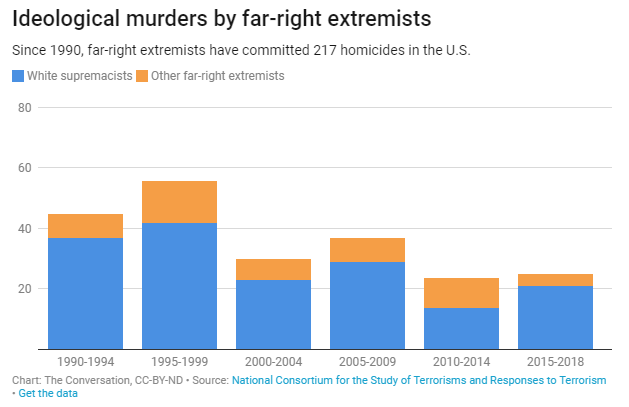 From 1990 to the present, far-right extremists have committed 217 ideologically motivated homicides. 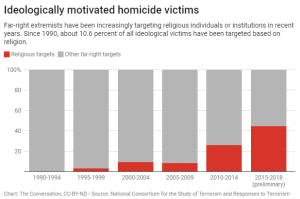 Of these homicides, 19 targeted religious institutions or individuals thought to be associated with a particular religion. Eleven were motivated by anti-Semitism, specifically.